Self Adhesive Magnetic Rolls and Sheets - Choose a size from the links below. Thickness is listed below the size. 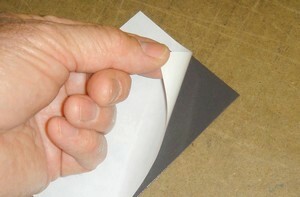 Peel off the paper backing and stick on the back of any paper item. Turns anything into a magnet. We have sheets of any size and rolls 24 inches wide and any length. We have sheet magnet ranging from 15, 20, 30 and 60 mils thick. The thicker the magnet the stronger it is. Call for custom sizes and quantity discounts. Below are some helpful videos for cutting and applying magnet for photos, magnetic cards and save the date magnets. *Minimum quantity restrictions may apply. This Free Shipping offer applies to Standard Shipping within the U.S. only. Not available on orders shipping internationally. Cannot be applied to previous purchases. Terms subject to change. This item qualifies for FREE Priority Shipping but if you add items to your order that don't qualify then you will be charged our regular shipping fees for those items.